Description: The Heron is recognized as maintaining calm, stability and fluidity. 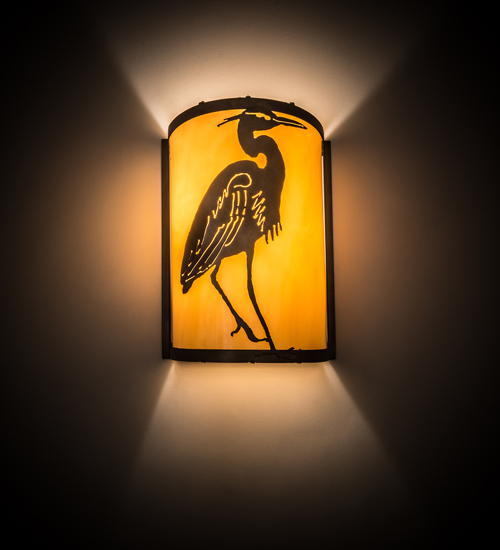 This large, longneck wading bird stands tall in a solid metal profile finished in Antique Copper and highlighted on a stunning Tawnyrock Idalight diffuser. This exquisite wall sconce is handmade by highly skilled artisans at the Meyda facility, at the foothills of New York's majestic Adirondack Mountains. Custom sizes, styles and colors are available, as well as dimmable energy efficient lamping options such as LED. The wall fixture is UL and cUL listed for dry and damp locations.